Join us Saturday September 29th at Freewheelin’ Farm for their annual Harvest Party & Art Show! Directions: take highway one north, 5 miles from Santa Cruz and turn left on Scaroni Road. Make an immediate right after the railroad tracks and follow the road to the right around the storage container. Drive as far as you can on that road and it will dead end into the party area! Summer is quickly coming to an end but in Santa Cruz it’s the time of year when the dry farmed tomatoes are at their best. It was this time last year that I my good friend shared a recipe for Pasta Pomodoro with dry farmed tomatoes. This year we’re going back to canning, and canning a pantry staple… Ketchup. I didn’t even know that I liked ketchup until a week ago when I had the privilege of judging the condiments competition for the Eat Real Festival in Oakland*. I tasted the most amazing ketchup and decided that I needed to give this condiment a try. I’m so glad I did! 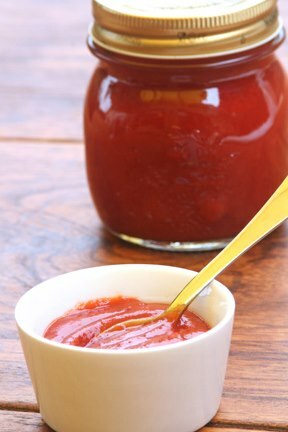 You’ll want to make enough of this to last you for the year because you won’t be able to go back to store bought ketchup after you make your own. *The Eat Real Festival is coming up on September 21st-23rd at Jack London Square in Oakland. It’s a weekend of great food and fun! This recipe yields 3 half pints plus a little extra for the fridge.